CONVERSABLE ECONOMIST: Is Job Disruption Historically Low in the US Economy? Is Job Disruption Historically Low in the US Economy? Discussions of how advances in technology, trade, and other factors lead to disruption of jobs often seems to begin with an implicit claim that it was all better in the past, when the assumption seems to be that most workers had well-paid, secure, and life-long jobs. Of course, we all know that this story isn't quite right. After all, about one-half of US workers were in agriculture in 1870, down to one-third by early in the 20th century, and less than 3% since the mid-1980s. About one-third of all US nonagricultural workers were in manufacturing in 1950, and that has now dropped to about 10%. These sorts of shifts suggest that job disruption and shifts in occupation have been a major force in the US economy throughout its history. 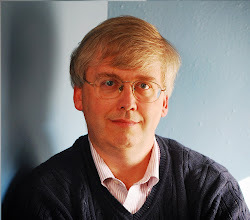 "Indeed, if we could go back in time and ask someone in 1900 about the pace of technological change, they would likely tell a similar story about its acceleration, citing the proliferation of amazing innovations (e.g., cars, electric lighting, the telephone, the record player). But notwithstanding iconic innovations such as electricity, the internal combustion engine, the computer, and the Internet, change is almost always more gradual than many think. Indeed, as historian Robert Friedel notes, “even the technological order seems more characterized by stability and stasis than is often recognized.” And as discussed below, that is likely to be the case regarding technology-induced labor market change." The paper is packed with examples of American jobs that have boomed and then diminished over time. The number of workers on railroads boomed in the late 19th century, but fell throughout the 20th century. "Seventy years ago, tens of thousands of young men and boys worked in bowling alleys as pinsetters, setting up the pins after the bowlers had knocked them down." More than 110,000 people were employed as elevator operators in 1950. The number of motion picture projectionists fell from almost 25,000 in 1970 to about 3,000 today. The number of automobile mechanics peaked at over 1.8 million in 2000, but had fallen by over 300,000 to about 1.5 million by 2010--mainly because improvements in auto quality made a lot of mechanics obsolete. "For example, while 180,000 Americans were employed as travel agents at the turn of the millennium, with the emergence of Internet-based travel booking, just over 90,000 were employed in 2015. Likewise, there are 57 percent fewer telephone operators, 41 percent fewer data-entry clerks, and 3 percent fewer postal-mail carriers than there were in 2000, even though the volume of information transactions has grown, all because of digital automation and substitution." The review isn't exhaustive: for example, the paper doesn't mention that in the late 1940s, AT&T employed more than 350,000 switchboard operators, or that the number of telephone operators who provided phone numbers and connected calls used to be in the tens of thousands just a few decades ago. "For example, in the 1950s and 1960s, many occupations grew extremely fast, even after controlling for employed worker growth. For example, in the 1960s, 885,000 janitors were added as offices expanded, 700,000 nursing aides as health-care consumption increased, and 600,000 secondary-school teachers as today’s baby boomers started to enter high school. At the same time, many occupations either declined outright or grew much more slowly than overall labor-force growth. For example, office-machine operators (except computers) fell by over 400,000; office clerks fell by 1.8 million; material moving workers fell 1.5 million; and other production workers fell by 1.9 million workers, as manufacturers increased automation." "The findings are clear: Rather than increasing, the rate of occupational churn in the last few decades is the lowest in American history, at least since 1850. Under method one, using the occupational categories of 1950, occupational churn peaked at over 50 percent in the decades between 1850 to 1870. (See figure 7.) But it was still above 25 percent for the decades from 1920 to 1980. In contrast, it fell to around 20 percent in the 1980s and 1990s, to just 14 percent in the 2000s, and 6 percent in the first half of the 2010s." This specific measure is surely rough-and-ready, and so the authors offer some other approaches along these general lines. The same lesson keeps coming up. The dramatic shifts in agricultural jobs from the 19th century into the 20th century, the rise and fall of manufacturing jobs, and many other shifts in technology and trade have been causing the US economy to have a high level of occupational shifts for a long time. 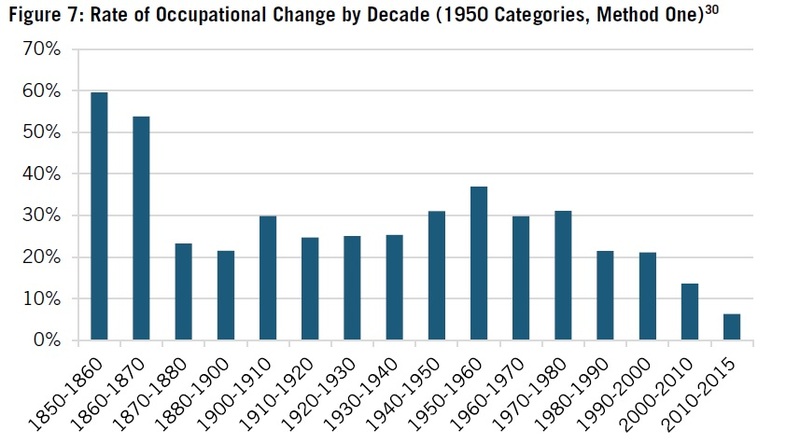 Since the start of the 20th century, the level of occupational shifts has actually been relatively low. There are lots of reports out there about how technology will affect the jobs of the future, ranging from the sensible to the weirdly apocalyptic. A good sensible example is the recent report from McKinsey on "What the future of work will mean for jobs, skills, and wages" (December 2017). There's lots of useful and thought-provoking analysis on what jobs will change, in what ways, in what countries. But one bottom line of the analysis is an estimate that overall, "Our scenarios suggest that by 2030, 75 million to 375 million workers (3 to 14 percent of the global workforce) will need to switch occupational categories." The numbers are big. But that degree of occupational change over the next dozen or so years is not at all unprecedented.